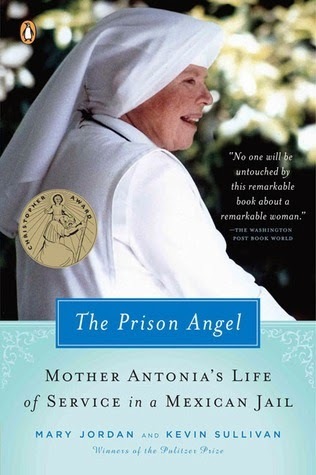 I first heard about Mother Antonia in a New York Times article written about her shortly after her death in October 2013 and mentioned her in a Friday Four. Her story seemed completely unreal. A twice-divorced Catholic mother of seven from Beverly Hills, California, feels called to become a nun and serve the poor. When none of the religious communities will accept her because of her marital history and her age, she sews her own habit, moves to Mexico, plants herself in a cell in one of the most notorious prisons, and begins loving and serving those around her. Her presence and example prompt changes in prison administrators and guards as well as the prisoners and their families. Guards treat inmates with more dignity. Prison riots simply stop when she walks in to harm's way. People find hope again when a single person shows them kindness. Incredibly far-fetched, isn't it? Mother Antonia might be one of the most real people who's ever lived. Despite a fairly privileged upbringing, the woman born as Mary Clarke was aware of the poor and disadvantaged from a young age and often felt "a gnawing feeling inside her, a sense that there were important things she needed to do." In addition to raising her seven children, she threw herself into charity work, organizing contributions to be sent to war-torn Korea, running Christmas parties at children's hospitals, and opening her home to orphans on holidays. But after her second divorce, it just wasn't enough. She had been visiting the La Mesa prison in Tijuana, Mexico, regularly for several years and "every time she left, she had the nagging feeling she was letting someone down, leaving behind someone who needed her." The prison warden had offered to let her stay overnight and so, after much prayer and thought and "wrestl[ing] with the idea" she decided to make the leap. Despite the fact that no religious order would accept her, she put on a homemade habit and moved to La Mesa. Mary Jordan and Kevin Sullivan report, "She blazed her own trail...She believed down to her toes that God had chosen this life for her and that He had been shouting His plan to her for years." At La Mesa she was a force of nature. She slept on the women's cell block, right next to all the prisoners, so she would be there for anyone who needed her at any time. She was irresistible and a "hustler" who "attracted an increasingly diverse group of people who wanted to help her" including volunteers who would gather supplies, clothes, food, and medicine for her to distribute, judges and lawyers who would assist prisoners with legal matters at Mother Antonia's request, and doctors and dentists who performed thousands of surgeries on prisoners for little or no charge. She befriended the worst, most violent criminals; she humanized the inmates in the eyes of the guards and the guards in the eyes of the prisoners. "She always finds the humanity in every person." She told a hardened prisoner, "You are somebody because you are God's child. And none of the rest of it means anything." Later she explained why she was able to show love to those who had been responsible for causing so much pain to others, "I knew that once I choose who I love and who I don't, I am no longer God's servant." One of her admirers described her aptly as "a miracle that repeats itself every day." Mother Antonia's confidence not only in God but also in her own ability to know what He wanted her to do was unwavering. "She had never put rules ahead of faith" and when "she thought her church's rule ran counter to its true purposes" she followed the path that she knew God wanted her on, regardless of the obstacles. "This woman is just joy and happiness, period." What a remarkable woman! The amount of good Mother Antonia did for "the least of these," in a place few others would voluntarily go, is incalculable. I'm adding her to my list of heroes.